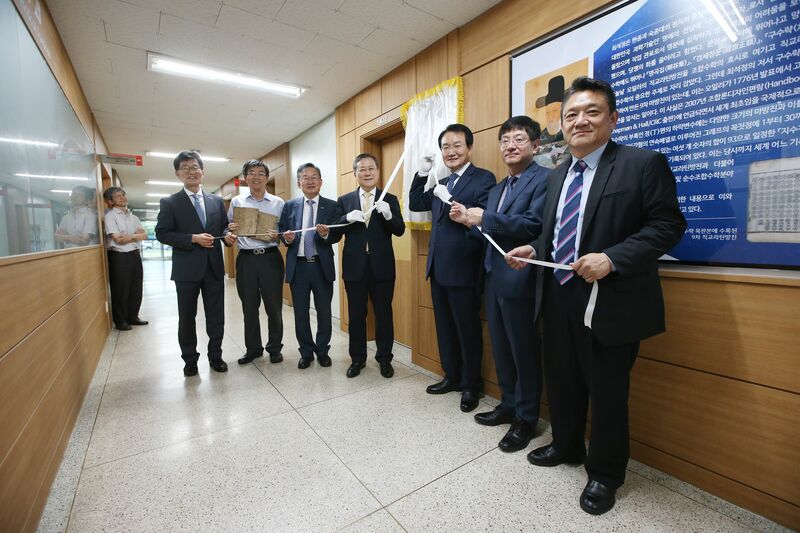 A new “Choi Seok-jeong Seminar Room” is open at the room 1401 of the E6-1 building. 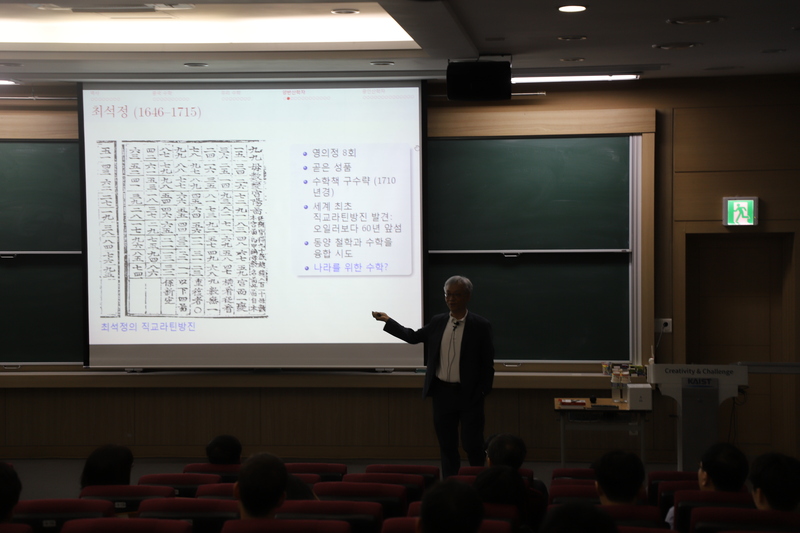 Choi Seok-jung Seminar Room is established to honor the scientific spirit of Choi Seok-jung (1646-1715), a top government official and a mathematician of the late Joseon Dynasty, and succeed his scholarly spirit ahead of his time. Choi Seok-jung was not only a prominent figure who spent eight times as a prime minister but also wrote a mathematical book called ‘Gusuryak’. Gusuryak became widely known to the mathematics community thanks to the effort of Prof. Do Young Kwak and Prof. Sang Geun Hahn in the early 1990s. In the last volume of Gusuryak, Choi uses orthogonal Latin squares of order 9 to construct a magic square. This was at least 61 years ahead of the paper of Leonhard Euler, published in 1776. 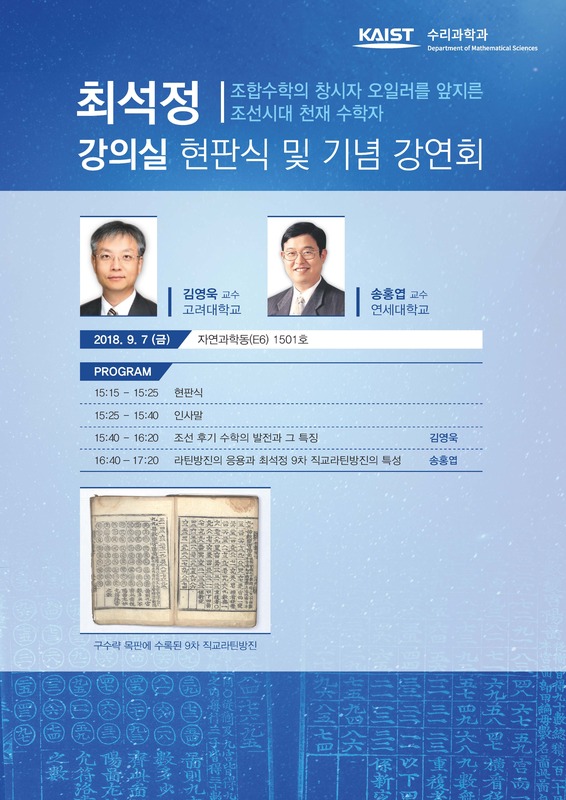 Choi was appointed to the Korea Science & Technology Hall of Fame in 2013 by the Ministry of Science and Technology and the Korean Academy of Science and Technology. 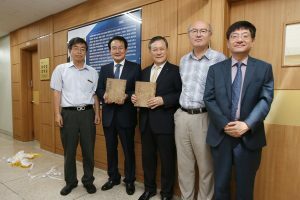 On September 6, 2018, a ceremony was held to commemorate the completion of the Choi Seok-jeong seminar room. 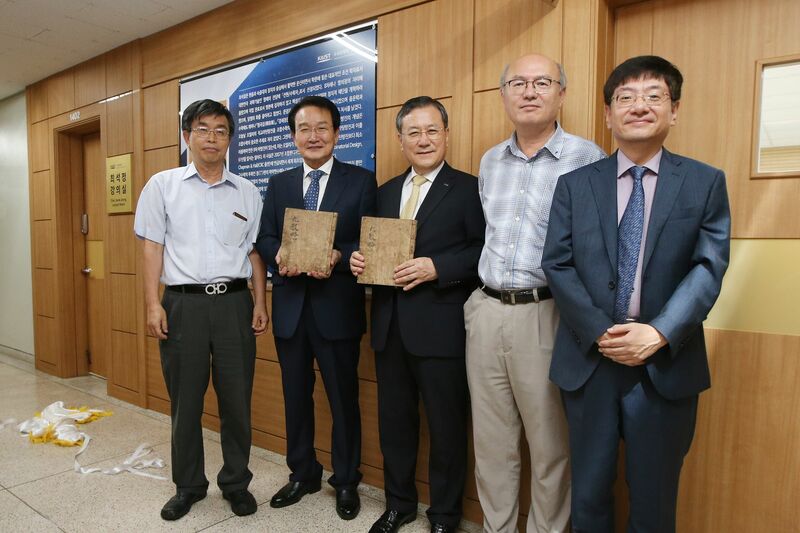 Present at the ceremony were Jae-ill Byun, a National Assemblyman, President Sung-chul Shin of KAIST, Department Head Yongnam Lee, KAIST vice presidents, and the department’s faculty members. On September 7, 2018, our department hosted talks on Choi Seok-jeong. 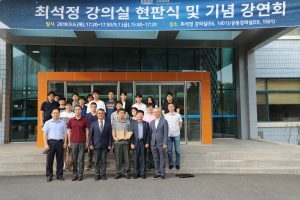 Prof. Young Wook Kim (Dept. of Mathematics, Korea University) gave a talk titled “The Development of Mathematics in Late Chosun Dynasty and its Characteristics,” which was followed by the talk titled “Applications of Latin Squares and the Characteristics of Choi Seok-jeong’s Orthorgonal Latin Squares of order” by Prof. Hong-Yeop Song (Dept. of Electrical and Electronic Engineering, Yonsei University). 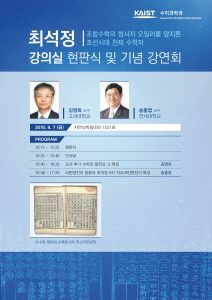 Choi Seok-jung Seminar Room will be available through reservation for everyone in the department.